Before you accept any offer from an insurance company, make sure to have your offer reviewed by a personal injury attorney. In the vast majority of situations, the insurance company is not offering you as much as they could and/or should for your injuries. The insurance company is offering you money for you to go away. They want you to see a little bit of money and jump at the opportunity to make some money. Once you accept their offer, they will send you a release for you to sign. If you sign the release, you will lose your rights to pursue anything in the future. This happens very often a few days after a car accident. After the insurance company hears that you were involved in a car accident, they will want you to sign a bodily injury release for a fraction of what your case is worth. 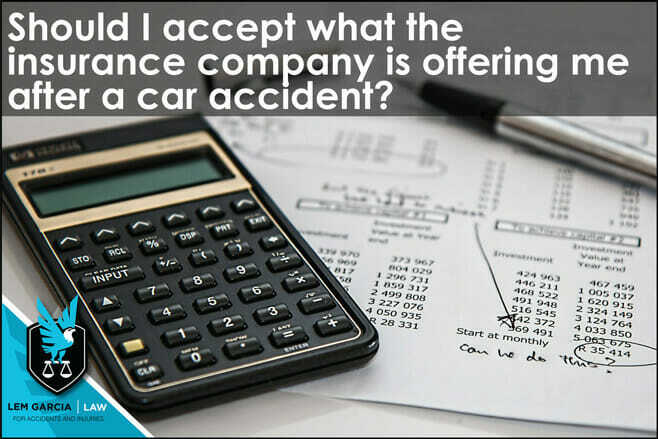 For example, if you are rear-ended by a truck, the insurance company for the truck driver might call you the next day and try to settle your bodily injury claim for $1,000 and $2,000 for your medical bills. In that situation, they will be able to settle your case for $3,000. If you were injured from the crash, that is most likely a fraction of what your case is worth. It is way too early to tell how seriously you were injured from a crash only one day after it. You might need treatment for several months, or several years, before you are finished getting medical treatment for your injuries. You might even have a permanent or serious injury where the pain simply will not go away. If you agreed to accept the $3,000 for your case, you will not be able to pursue anything against the other party anymore. You will have to pay for the medical treatment on your own and you will not get any more money for your pain and suffering from the other party. This is true no matter how much more treatment and/or pain you are in after you sign the settlement release. Once you sign, your case is over. An experienced and trustworthy personal injury attorney will be able to tell you if what they are offering you is fair and if he or she will be able to get more money for you. It is a very rare occasion where I tell a potential client that what the insurance company’s offer is fair and that they should take it. The insurance company is under no obligation to pay you what you believe is fair. The insurance adjuster’s obligation is to follow the directions they are given from their boss. Usually, that instruction is to pay out as little as possible to resolve the claim. Ultimately, don’t sign anything until talking to a personal injury attorney. In fact, do not even attempt to resolve the matter on your own. You may hurt your case in an attempt to negotiate the value of your case with the insurance adjuster. You have nothing to lose by talking to an attorney. Most personal injury attorneys do not charge anything for consultations and they will provide you with their honest assessment of your case based off of years of experience. Car accident attorney in West Covina, Lem Garcia, provides free consultations without any obligation. Call Lem today to find out what you should do about your case.